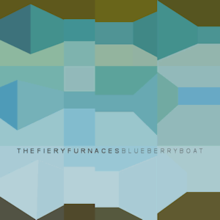 The Fiery Furnaces – Blueberry Boat – But Is It Any Good? WHAT’S IT ALL ABOUT: Tuneful weirdness from the brother-sister duo. SOME WORDS, PHRASES AND CLAUSES ABOUT THIS RECORD: For their second album, the Friedbergers decide that they weren’t weird enough, and so they play with instruments, tempos, dramatic changes, and long suites instead of short songs. It is a success, though some tracks don’t work because it’s just too much going on all at once that contradict with each other. Also, five cuts time out at 7:52 or more – though the songs to me don’t seem that long those without patience may not dig it. All in all, I like it. I’m not afraid of this weird – since it seems very song-based and contextual. NOTES & MINUTIAE: The song “1917” makes a reference to the year the White Sox last won the World Series when this was recorded. The next year, the White Sox WON the World Series. Coincidence? IS THERE A DELUXE VERSION: Nope. GRADE: B+-: You may like it. You may love it. I think it’s really good for the most part, but they needed to edit a smidge.